and today it really feels like it! After pinning this wreath months ago, the weather inspired me to try this wreath. 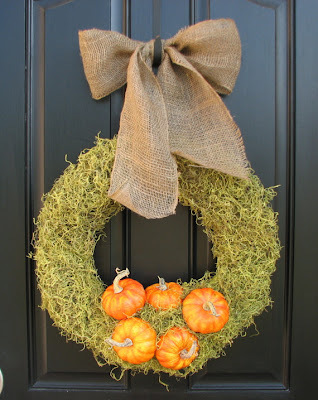 I used a foam wreath form, reindeer moss, and a mixture of faux gourds and pumpkins- couldn't find just faux pumpkins- and just used the glue gun to put it all together. I think it took me about 1 hour and that includes taking a wine break because the moss stressed me out- I admit it, I have the attention span of a gnat. I really love it, but after looking at the inspiration, I'm thinking I should maybe hang it so that the wreath is a little lower than the bow...what do you think? About the bow, I'm going to admit that I didn't make it- 3 girls and no clue how to make a bow- but I spotted it in a shop recently. Head over to Rhoda's at Southern Hospitality for more fall inspiration. That's adorable...both of them! I have got to get a Pinterest account! Thanks! Allison, if you want me to send you an invite for pinterest, lewt me know...be warned, it's so addicting and you will find yourself spending way too much time on it!